A micro-histological analysis of composite faecal samples was used to determine the food plants consumed by the aoudad Ammotragus lervia (Barbary sheep) in the mountains of Bou Hedma National Park, as well as to study food preferences and seasonal variation of the diet of this ungulate. A total of 19 plant species was identified in the faecal samples: 8 grasses, 6 browse types and 5 forbs. The annual diet of this ungulate is composed of approximately 67% grasses, 17% browse and 16% forbs. Two grass species, Stipa parviflora and Stipa tenacissima, comprised 97% of grasses consumed and 63% of the annual diet, and were eaten in the year with considerably greater frequency than any other plant species. The diet of the aoudad at Bou Hedma National Park showed a seasonal variation. For example, grasses were consumed the entire year with a preference in spring (72.57%) and summer (78.31%), but their occurrence in the diet dropped in winter (38.7%). Browse was eaten preferentially in autumn (21.86%) and forbs were utilised most during winter (43.22%) and least during summer (7.53%). Our results show the plasticity of the Tunisian aoudad's diet and identify it predominantly as a grazer. In Tunisia, the aoudad is the only representative of wild caprinids and it is considered the flagship species of Tunisian wildlife. According to the Red List of Threatened Species of the International Union for Conservation of Nature (IUCN), the aoudad is classified as a globally 'vulnerable' species.6 It has disappeared from most of its original environment and was considered by Schomber and Kock to be on the verge of extinction in Tunisia as a result of overhunting and a reduction in its habitat. This species is considered in Tunisia by the National Register of Wild Species as 'critically endangered'. Indeed, the Barbary sheep is exposed to threats that may cause its extinction in the wilderness such as overhunting for its meat and overgrazing of its habitat by livestock.11 The National Park of Bou Hedma is one of the country's biotopes that has succeeded in rehabilitating a very small number of aoudad. In a report of the General Directorate of Forests,12 the population density of the aoudad in the park was estimated at about 50 individuals. In its native habitat in northern Africa, the aoudad is largely unknown apart from the little research done regarding its distribution.3,4,9,11 The social organisation of the aoudad population of Chambi in Tunisia was recently studied by Ben Mimoun et al.13 The study of diet is a necessary step in understanding the eco-biology of herbivorous animals. Indeed, besides its applicability in quantifying the food ingested by animals, it can also contribute to effective management and conservation of endangered herbivores such as the aoudad. No sophisticated food habit studies have been made on this species in North Africa, but general references note that both browse and herbaceous vegetation are eaten.14,15 In Tunisia, the diet of this endangered North African wild caprid has never been studied. Our objective was to study the feeding behaviour of the aoudad occupying the mountains of the Bou Hedma National Park in central Tunisia. The knowledge of the trophic regime of this ungulate is an opportunity to increase our understanding of the feeding behaviour and the requirements of this species. where ni is the total number of fragments of the species (i) identified and Ni is the total number of fragments counted. The average frequencies (AF%) provide a good estimate of the diet by indicating the range of plant species collected by the animal from its habitat and they also show food use within the year. Species with an AF<1.0 were not a major part of the annual diet and were classified as trace foods.18 Non-parametric Kruskal-Wallis tests24 were applied to compare average frequencies of the different forage classes and plant species consumed by the aoudad; p<0.05 was considered significant. The food spectrum of wild aoudad in Bou Hedma National Park comprised 19 plant species. The average annual diet of the aoudad sampled in this study was found to consist of 67.12% grasses, 16.70% browse and 15.81% forbs (Table 1). Unidentified species represented only 2.36% of the diet. The principal forage plants identified in the diet of aoudad in Bou Hedma National Park throughout the year were two grass species (Stipa parviflora and Stipa tenacissima) four browse species (Periploca leavigata, Juniperus phoenicea, Pistacia lentiscus and Retama raetam) and two forbs (Helianthemum kahiricum andGlobularia alypum) (Table 1). The diet of the aoudad at Bou Hedma National Park shows a seasonal variation. 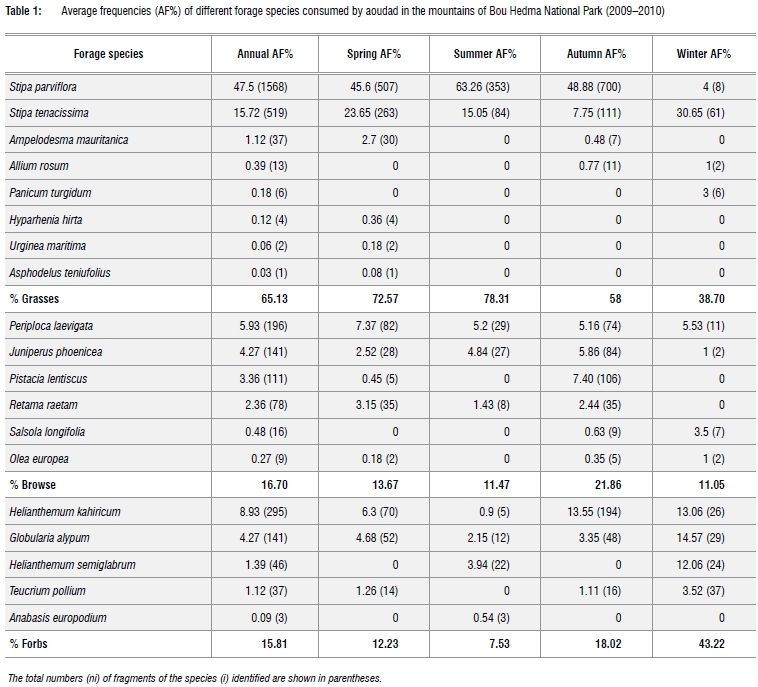 The spring food spectrum is the largest with 14 plant species in comparison to 13 in autumn, 12 in winter and only 9 species in summer (Table 1). There was no significant difference in the consumption of each forage class among the four seasons for grasses (K=1.44; df=3; p>0.05), for browse (K=2.43; df=3; p>0.05) and for forbs (K=3.16; df=3; p>0.05). However, interaction between the effects of season and forage class was identified (K=6.57; df=2; p=0.037). Indeed, the aoudad shows a higher use of grasses during the spring (72.57%), summer (78.31%) and autumn (58%), than in winter when the diet is concentrated on forbs (43.22%). Furthermore, a net increase in the consumption of browse was observed in autumn (21.86%) (Table 1). Considering each forage class separately, the Kruskal-Wallis test indicated a significant difference in the consumption of grass species by the aoudad in spring (K=23.59; df=7; p=0.002), summer (K=22.86; df=7; p=0.002), autumn (K=22.69; df=7; p=0.002) and winter (K=21.26; df=7; p=0.003). In fact, eight species of grasses were consumed in the National Park, but only three species - Stipa tenacissima, Stipa parviflora and Ampelodesma mauritanica - had an AF of >1.0 in the annual diet. The genus of Stipa alone represents 97% of grasses consumed and 63.22% of the annual diet of animals, and was eaten throughout the year with considerably greater frequency than that of any other species (Table 1). No significant seasonal variation was observed in the consumption of browse species (K=10.82; df=5; p>0.05), but during each season the aoudad showed a preference for only a few species: in spring (K=14.07; df=5; p=0.015), summer (K=15.54; df=5; p=0.008), autumn (K=12.73; df=5; p=0.026) and winter (K=13.87; df=5; p=0.016). 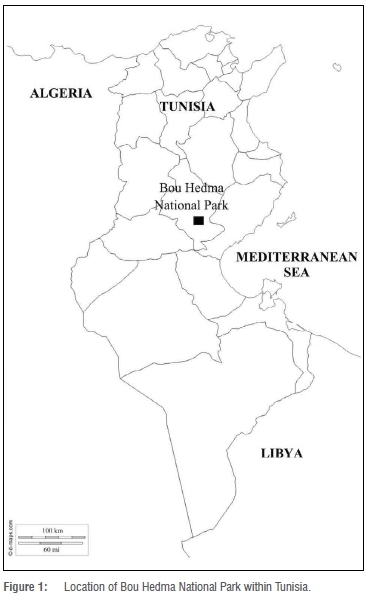 Six browse species were eaten by the aoudad in Bou Hedma National Park: a single tree species (Olea europea) and five shrubs (Periploca laevigata, Juniperus phoenicea, Pistacia lentiscus, Retama raetam and Salsola longifolia). Among this forage class, only two species - Periploca laevigata and Juniperus phoenicea - were eaten by the aoudad during the year with significant relative frequency. The main browse species used by the aoudad was Periploca leavigata which occurred the most in the samples of droppings analysed in spring (7.37%) (Table 1). No significant seasonal variation was observed in the consumption of forbs (K=9.36; df=4; p>0.05) (Table 1). A clear seasonal preference for certain species of forbs was shown: spring (K=11.22; df=4; p=0.024); summer (K=11.12; df=4; p=0.025); autumn (K=11.88; df=4; p=0.018); and winter (K=11.44; df=4; p=0.022). Indeed, five forb species were identified in the diet of the aoudad in the Bou Hedma National Park but only two species, Helianthemum kahiricum and Globularia alypum, appeared during all seasons with significant relative frequencies compared to the rest of the plants in this forage class. Helianthemum kahiricum of the Cistaceae family was consumed the most throughout the year, except in summer. The consumption of the second species, Globularia alypum, increased markedly in winter (14.57%) (Table 1). This variation in the number of plants used by the aoudad between these regions can be related to differences in the specific richness of vegetation available. The scarcity of plant species constituting the diet of the Tunisian aoudad could potentially be associated with plant identification problems from faecal samples and the apparent ease of digestibility of tender grass and succulent forbs.31 In Bou Hedma National Park, the aoudad shows a clear preference for grasses (67% of the annual diet), followed by browse (17%) and forbs (16%), which allows this ungulate to be identified as a grazer.31 This preference for grasses can be explained by the abundance of these plants in the mountain steppe of Bou Hedma National Park.32 Our results concur with those obtained for this ungulate in the Edwards Plateau region of Texas where the annual diet consisted of 61% grasses, 21% browse and 18% forbs31, and in California where grass classes represented 97% of the annual diet.33 Furthermore, a relatively high level of grasses (42%) in the diet of aoudads was observed by Ogren34 in the Canadian River Gorge of northeastern New Mexico. The low frequency of forbs in the diet of the aoudad at Bou Hedma National Park may be the result of the high pressure of overgrazing by domestic animals as demonstrated by Ogren34 in the Canadian River Gorge and by Simpson et al.27 in Palo Duro Canyon. Indeed, Ramsey et al.35 found that in pastures with low forbs availability, the aoudad preferred grasses to browse, which led the authors to surmise that this forage class was the alternative food source in overgrazed areas. Nevertheless, our results differ from those obtained in Palo Duro Canyon, where the annual diet of the aoudad is composed of 70% browse, 20% forbs and only 10% grasses,30 and in the Guadalupe Mountains where the aoudad consumes 42% browse, 38% forbs and only 20% grasses.18 According to another study conducted in Texas,27 woody browse is the most important forage class in spring (53%), summer (68%) and autumn (48%), while browse (42%) and grasses (43%) are equally important during winter. Also, in the Eastern High Atlas National Park in Morocco, browse was found to be the major dietary component during winter (52.7%) and autumn (56.6%). Grasses and forbs represented 27.4% and 19.9% of the diet, respectively, in autumn and 21.0% and 23.4% of the diet, respectively, in winter.29 As has been demonstrated in the Guadalupe Mountains by Simpson et al.18, the class of grass in our study has a fairly high rate of consumption in summer and spring, and is at its lowest in winter. Evans36 also recorded low winter use of grasses in Palo Duro Canyon. The high consumption of grass species during the breeding season, which tends to be focused in spring,25 can be explained by the fact that these plants reach a peak level of their protein content and digestibility during this period of the year.17 Moreover, the Tunisian aoudad tend to prefer open land13 with abundant grass species in the breeding season. The importance of the consumption of grasses with high nutritional value32 in summer can be justified by the increased requirements of the animals during this season, which is characterised by peak lamb drop and lactation.17 In our study, Stipa parviflora and Stipa tenacissima were the only major grass species consumed in all seasons with the highest consumption in spring and summer and the lowest in winter. The genus Stipa was also among the grasses preferred by the aoudad in Largo Canyon, New Mexico37 and was observed in the diet of this ungulate in Morocco in northern Africa.29 The great affinity to this grass plant is explained by its high pastoral value.32The increased consumption of browse in the autumn can be explained by the reduced availability of herbaceous plants during this season and highlights the plasticity of the diet of this ungulate. Our study showed that the highest use of forbs was in winter and the lowest use was during summer, mirroring the results obtained by Simpson et al.18 in the Guadalupe Mountains, New Mexico. We thank the forest directors for their support and for their role in facilitating access to Bou Hedma National Park, the park employees for their voluntary collaboration, and the members of the Animal Ecology Laboratory of Arid Land Institute, Medenine (Tunisia) who gave permission for the micro-histological faecal analyses. J.B.M. was responsible for the experimental design, for preparing the samples and for writing the manuscript. S.N. performed some of the experiments and made conceptual contributions.